According to the Bank of England, there are 3.7 billion genuine pound banknotes in circulation at any one time, worth an estimated £70 billion. In the first half of 2018, 223,000 counterfeit banknotes (with a ‘value’ of £5 million) were taken out of circulation. This means that less than one in every 2,000 banknotes in circulation is fake. Many of these counterfeit notes are withdrawn very quickly – often after a single use. As part of their duty to maintain confidence in the British currency, the Bank of England has been instrumental in providing educational materials and tools so that both businesses and members of the public can recognise when a banknote isn’t genuine. They also work with manufacturers and operators of ATMs in the payments industry to ensure that all cash machines meet minimum authentication standards. They cooperate closely with law enforcement agencies to try to identify and break up gangs of counterfeiters. The gradually switch-over from paper cotton to polymer banknotes is a new innovation. The first polymer banknote was introduced in the UK in 2016 and features the country’s wartime Prime Minister, Winston Churchill. Just over a year later, the paper £10 note was replaced by a polymer version, also featuring the English author Jane Austen. The polymer £20 note, with a tribute to the painter Turner, is due to be issued in 2020. 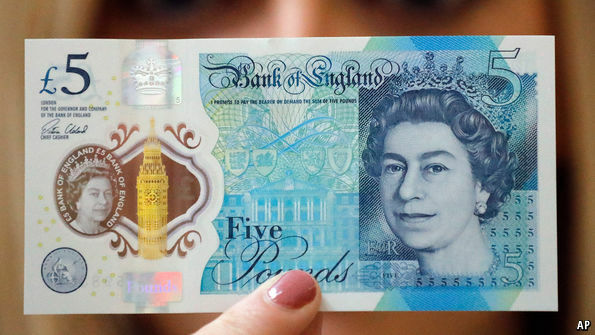 At the same time, the £50 note will also be issued in polymer. However, it hasn’t been yet decided who will appear on it although the Bank of England has asked for nominations of great British scientists. Apart from staying cleaner longer and lasting longer, these new banknotes (made of a thin, flexible plastic) are also more environmentally friendly. After the polymer notes are decommissioned, they are converted into plastic pellets which can be recycled to manufacture other products such as plant pots. The greatest benefit of the new polymer banknotes is that they contain a number of improved security features which make it much more difficult for counterfeiters to copy. Apart from their material (which is less easy to manufacture or buy than paper), both the £5 and the £10 note have a number of unique authentication features in their transparent window. This includes a border which changes colour as the note is tilted. The foil of the image is also different colours depending whether it’s on the front (gold) or back (silver). The foil patches on the notes changes from a number (five or ten) to the word ‘pounds’ as the note is tilted. Beneath the Queen’s portrait there is also micro-lettering which is only visible through a magnifying glass while the words ‘Bank of England’ have been printed in raised ink. Finally, if held under an ultraviolet light, the denomination of the banknote clearly appears as a number. If you have urgent need of cash, a direct lender can offer bad credit payday loans which can help you through your difficulty.